Kare-kare is a popular Filipino dish especially in the Tagalog region. The Filipino version of the beef stew flavored and thickened in a peanut - based sauce, with a variety of vegetables. The most common cuts of beef used are tail, shank or face. A combination of the three may be used and most cooks preferred to add tripe. If these are not available you can use round or sirloin cut. The meat is first tenderized, then sauteed in garlic, bagoong, annatto seeds and vegetables. Peanut butter is added during the last stages of cooking to thicken the sauce and give the characteristic flavor of the kari-kari. Most common vegetables used are string beans or snake beans, pechay or baby bachoy, eggplant and banana buds from the banana heart, (optional ). Kare-kare is always serve with white boil rice and bagoong alamang on the side. 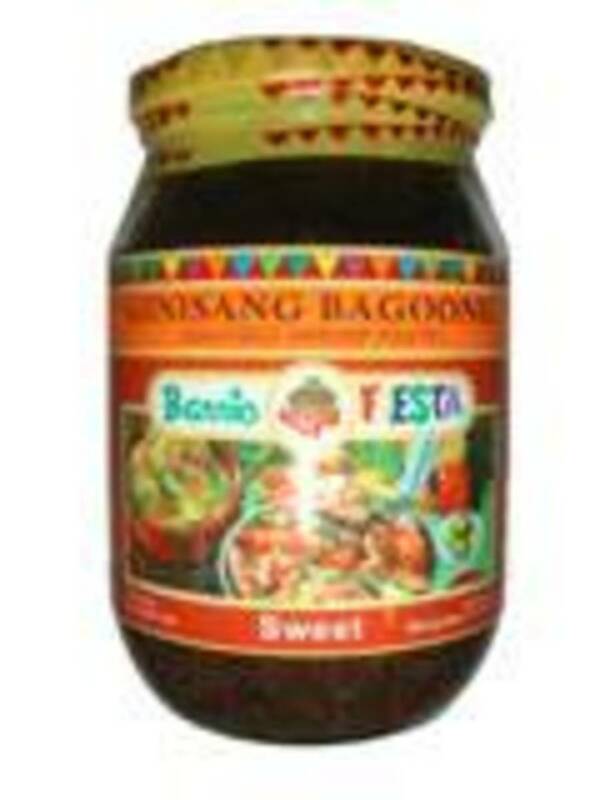 Bagoong Alamang is a paste of salted and fermented shrimp fingerlings, it is like a shrimp paste. Bagoong has a strong taste for some people but for me kare - kare is not kare kare if not serve with bagoong. If green mangoes are available, it will be nice to serve it as a salad. Wash the ox tail, legs and beef. Cut into serving pieces. 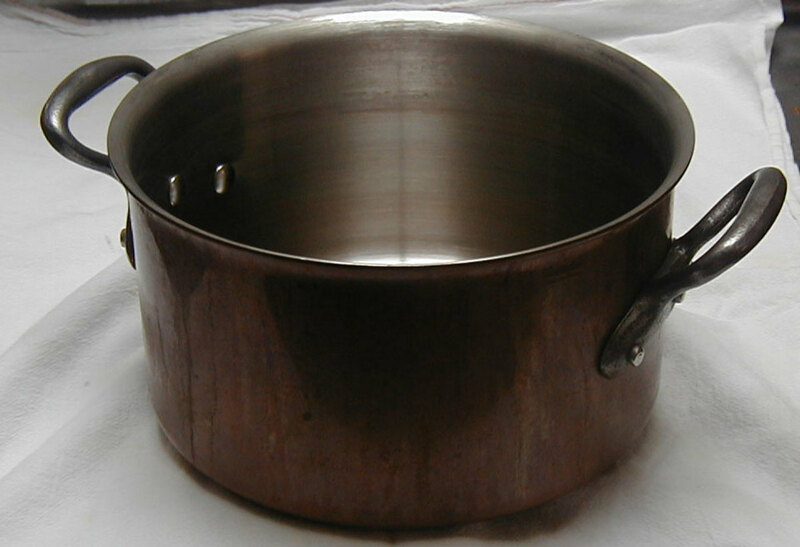 Place in a heavy saucepan with enough water to cover. Bring to a boil, remove the scums as it rises, cover, add more water if you need to. Kare kare is better if the meat is tender. Let simmer until the meat is tender this will take about 1-2 hours. Transfer the meat into a plate or a bowl and let it cool, set aside the stock. In a large caserrole put the cooking oil to sauté the garlic and onion in about 30 seconds. Put the meat in the skillet and continue mixing. Pour in the stock and bring to a boil for another 10 minutes. In a small bowl, stir the peanut butter with about 1/2 cup of stock and pour it in the caserrole. Stir to blend well. Cook for another 5-10 minutes until the sauce is thick. Serve hot with bagoong alamang and boil rice. Don't overcook the vegetables, you can also cook or blanch the vegetables separately in a caserrole and them mix it when the dish is about to be served. Traditionally, annatto (achuete) seeds are added to redden the dish. Annato seed are now also available in powder form. Bagoong is a paste of salted and fermented shrimp fingerlings. Every family or every cook has his/her version of Kare-kare, but one thing is common, this Filipino dish is a rich and heavy meal served with rice. An ideal Sunday lunch dish and goes well with special occasions like fiesta, family gathering, birthday party and even served on Christmas lunch or dinner. More Filipino Recipes . . . In the Philippines, Adobo is a style of cooking that uses vinegar, soy sauce and garlic. 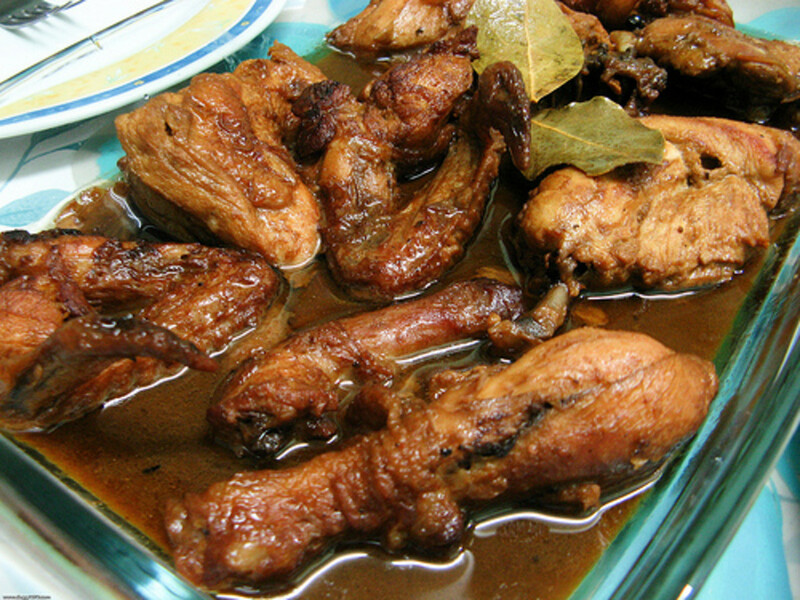 Adobo is popularly regarded as the Filipino national dish. A traditional Filipino style meatloaf, wrapped in an aluminum foil and steamed. There are so many ingredients needed and preparation time to make this recipe, but once it is prepared and cooked it can be stored and freeze. i find ur recipe too easy to follow. 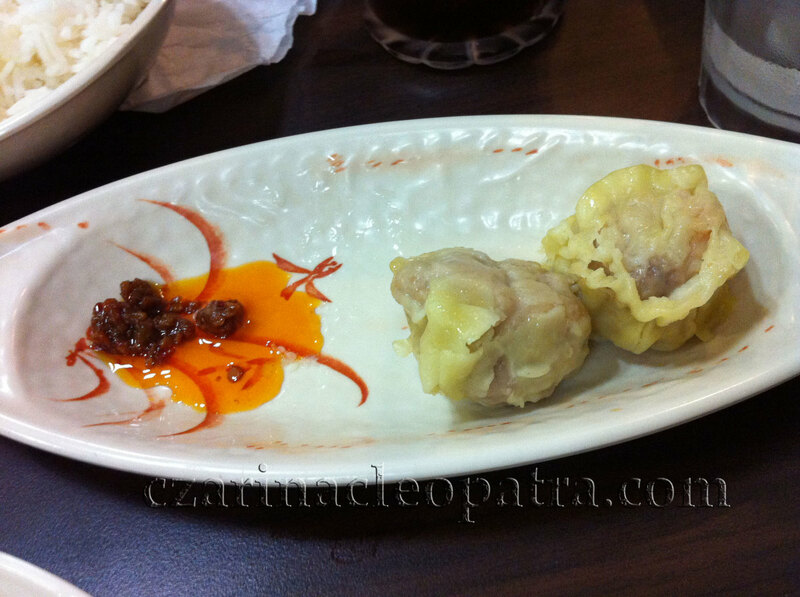 Im always craving for this dish though I used to eat it once a week buying in our fave kitchenette. sounds weird right but true! Helpful hub! I love kare kare! Thanks! My mother speciality is Kare Kare, but since i live in Switzerland i have not cook this for i even don't know how. I used to cook Italian, Swiss, Chinese recipes. 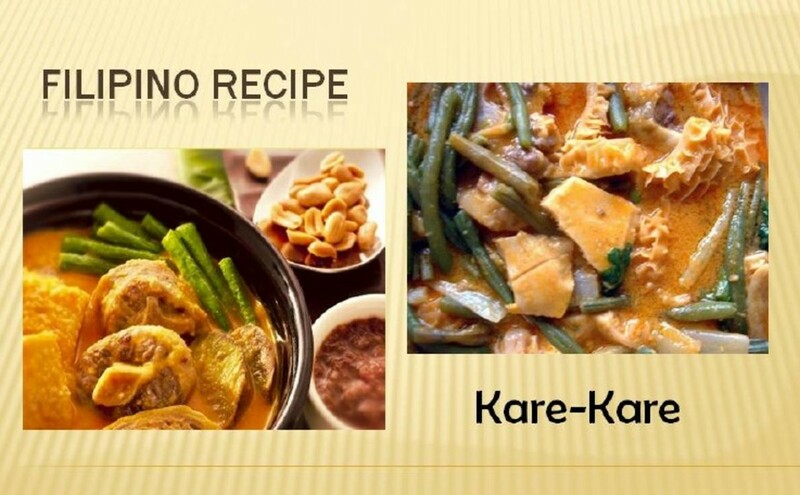 I love Kare kare, i will surely try your recipe and include it in my menu plan as a variety. Salamat. Even though, I like the kare-kare, I love the very spicy chicken adobo. The lumpia too is also good. I am a fan of Filipino recipes. I have a good number of Filipino friends who use to cook for us when we were in school in Kentucky. I miss those days. Thanks for sharing. I really love Filipino foods specially your kare kare. I miss these recipes back home in the Philippines. thanks a lot for sharing! This is the dish I grew up with. Oh...I love Filipino recipes! I love your kar-kare. thank you for sharing! thank you...my husband love it...i thought cooking karekare is difficult but i was wrong...it's soo easy pala...more power! I like kare-kare so much I just ate this dish when we were visiting Florida last month. Cooking is not my big thing but I'm willing to learn. I like the combination of salted shrimp paste. Thank you for the recipe. i surf the net just to find the right way on how to cook this food..thank you i find it easily.. this is my husband's favorite i really have to learn how to cook kare kare.. thanks! masarap ako mag luto ng kare kare...hmmm i love it. The perfect comfort food ... Kare-kare. It fills the stomach, and warms the cockles of my heart. Thanks for this! I've been looking for this. My wife isn't so interested in cooking that's why I searched for myself this recipe. Thanks! Rosario, what is the white liquid that you pour at the end, in the video? Plain milk? Coconut milk? I don't find it in the recipe. Anyway I definitely am going to make this dish and surprise my DH. The bagoong I don't know where to buy it but I'll find out. i rili love kare-kare. the taste as the bagoong blended with the dish is great as expected..yummmmmmyyyyyyy!!!!!! thanks for great recipes. 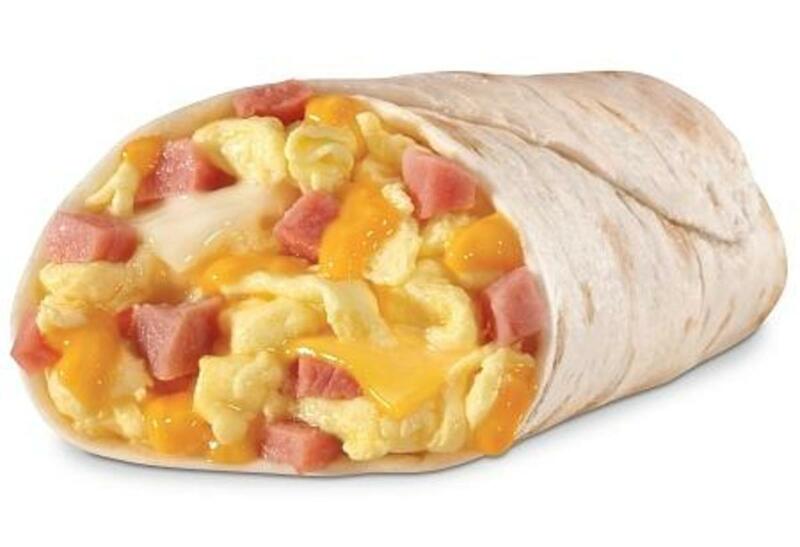 It look very delicious. like Indonesia food. Hello MM. I invented a killer Tofu/vegetarian non-allergenic kare-kare recipe that I love!